These Peace and Tranquility Lepidolite Earrings are absolutely enchanting. You all know how important sacred adornment is to me – the process of choosing gemstone jewelry with intention and care. These gorgeous silver-plated earrings are for anyone in search of serenity, relaxation, and calm. Wear these earrings to surround yourself in their soothing vibration anytime, anywhere. Those who know me know that I ADORE lepidolite. It is the one stone I always have on hand, as it is proven to lighten moods and lift your vibration. Lepidolite, a natural, crystallized form of lithium, grows with tourmaline and kunzite. Though its most beautiful color and delicate texture appear gentle, its powers are strong and well-documented. Our Native American ancestors would mine lepidolite and rub the stone, releasing lithium mica into their skin. It mellowed them out, relaxed them, and eased mood disorders. It also helped improve mood and relieve feelings of tension or anxiety. Today, we know that lepidolite still has this effect. This stone dissipates negative energy – none can sustain itself in its presence. It aids the physical and emotional bodies in so many ways, as it provides peaceful sleep, promotes rest and recovery from illness, provides relief from stress, and elevates moods. 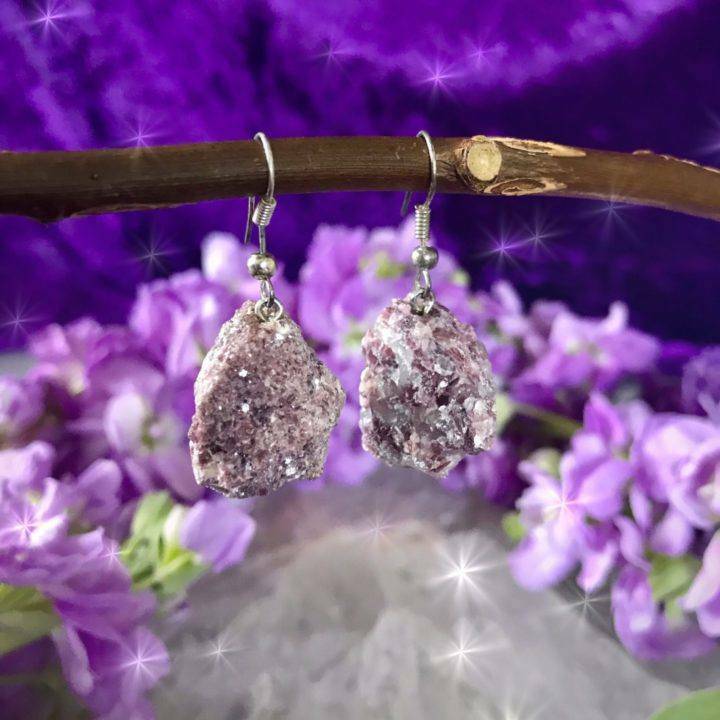 Wear these lepidolite earrings whenever you’re in need of this gem’s peaceful magic. As you wear yours, feel your spirit being soothed, released of all worry, fear, and tension. Rest still in the wisdom that all is well and as it should be, and you are safe and supported everywhere you go. 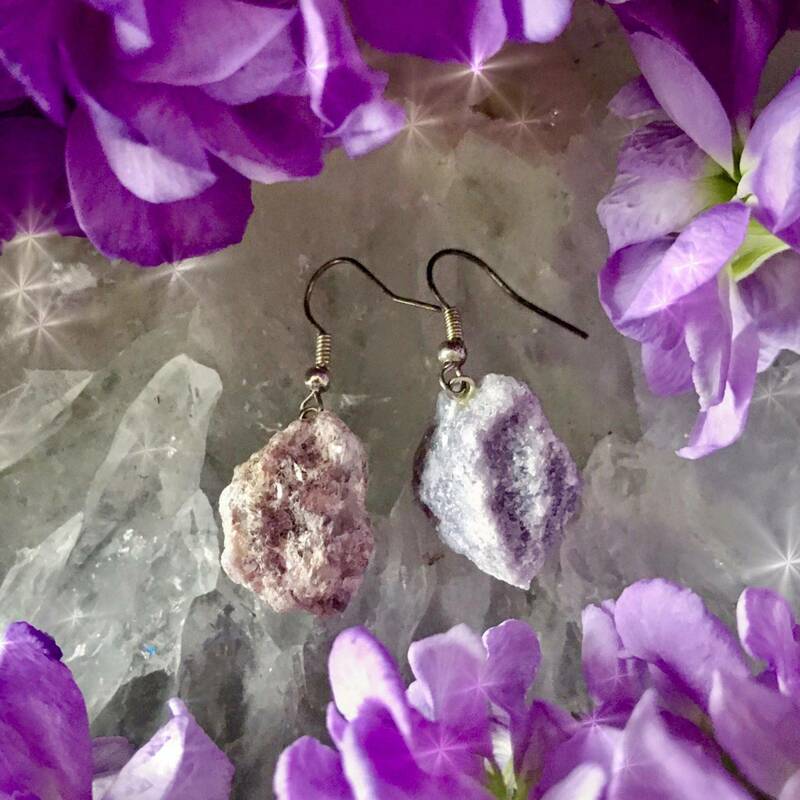 This listing is for one (1) pair of Peace and Tranquility Lepidolite Earrings (about 1” each). Yours will arrive lovingly parceled along with a single leaf of white sage and a card describing the properties of the stone.